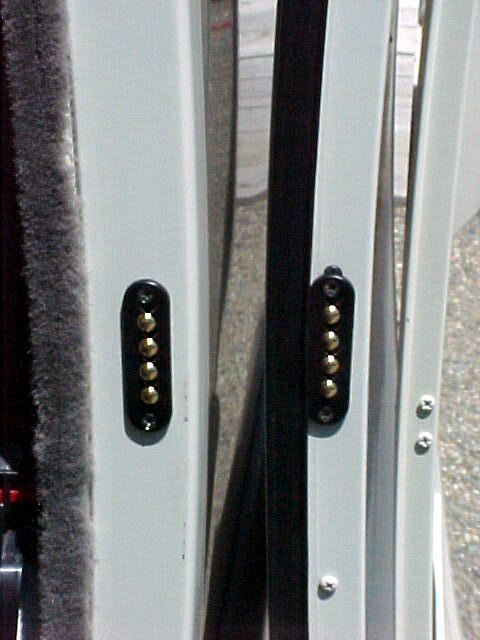 Probably the worst designed element of the Winnebago Rialta was the electrical wire transfer to the side door used in all Rialtas prior to 2002. The original designed used a spring type enclosure which housed the three wires which ran from the side wall into the door itself. These wires controlled the electric lock mechanism and were tied into the existing Volkswagen wiring for the front doors. 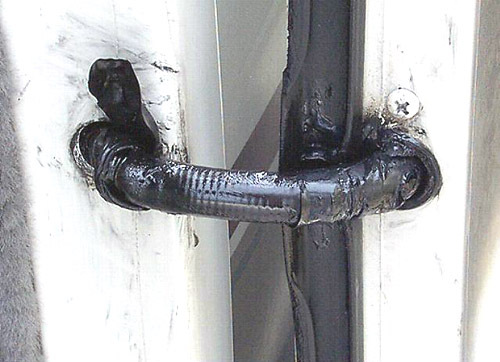 The actual connection occurs in an area right above the passenger's head and then the added Winnebago wires travel down the transition panel on the right sidewall, along the floor towards the door, and ultimately up to the hole in the door jamb where they entered the spring tube. The problem: the spring tube had a tendency to get hung up or snagged on either the hole in the wall jamb or the door jamb. Once the spring was snagged and the door completely shut, it would pinch one or more wires inside the spring. Even if the spring never caught caught, the constant bending and flexing of the wires would eventually cause one to break. The solution: Magnum Shooters or its equivalent. These are nothing more than spring loaded electrical contacts permanently mounted in the wall jamb and the door jamb. When the door is closed, the contacts touch each other and the electrical circuit is complete. When the door is opened, there are no wires or other items that have to make the bend such as the old style spring. This eliminates any stress or strain on the wires and provides a worry-free design. Winnebago started adding these as a production change beginning in May of 2001 which means any model year 2002 Rialta produced after that date should already have these electrical contacts installed in lieu of the troublesome wires and spring. Cost of the "magnum shooters" switch is about $25. Installing these new type contacts to replace the old design is not for the average do-it-yourselfer or RV owner. If requires a near-perfect cut out in the steel wall jambs and door jambs along with modifications to the wire loops in the door and in the wall. A saber saw with a metal cutting blade and a set of round and flat files are among the tools needed. Click on the picture on the right to view full size. NOTE: The picture shows 4 contacts, but you only need 3.